Cruising can take you to some of the most spectacular places on the planet. The photogenic plains of Africa, oceans of Australia and fjords of Norway have never been more accessible, but these breath-taking destinations are just the tip of the iceberg. Expedition-class ships by Seabourn and Silversea now sail to the farthest reaches of the world. The Galapagos Islands and ice shelves of Antarctica are within your grasp, and with them, spectacular animals. The Galapagos Islands are truly unique, most notably because of their wild inhabitants. The species here have evolved in almost complete isolation, making them distinct from every other creature on Earth. Stroll across the beach, by the cone of a volcano or through the trees and you can expect to find anything from a tiny finch to an oversized tortoise. But you won’t always have to be quick off the shutter. 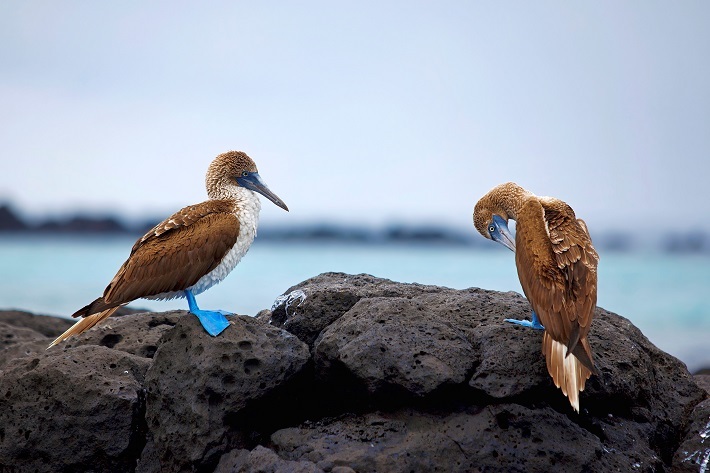 The beauty of the Galapagos Islands is their remote location. Few visitors and a harmonious ecosystem have left Galapagos animals with little to no fear of man: affording unrivalled (yet respectful) photo opportunities. The animal made famous by Planet Earth II’s iconic racer snake chase is no less endearing in real life. Built like Godzilla, a born free-diver and prone to shooting spouts of salt water from their nostrils, these amazing reptiles deserve a place in your Galapagos photo album. 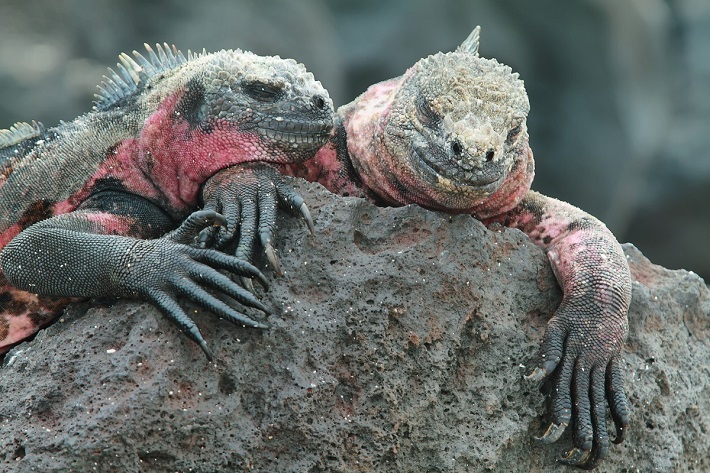 Not that you could miss them – so many iguanas bask on some Galapagos shores that, from a distance, the very rocks seem to shift and change. 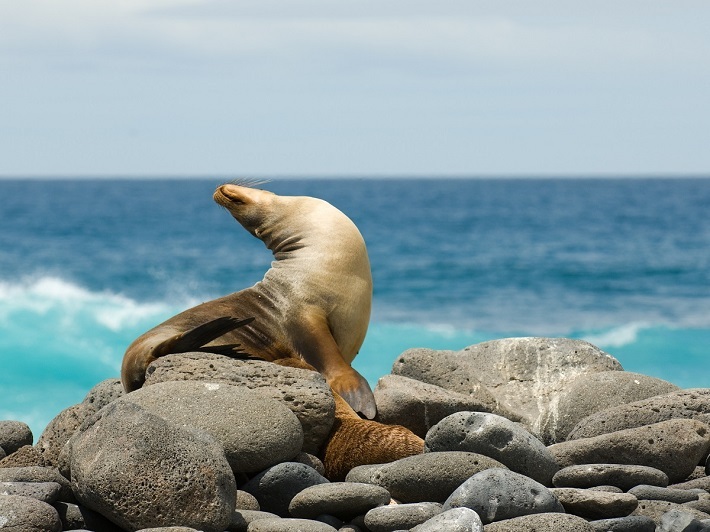 As soon as your cruise ship reaches the shore you will spot groups of Galapagos sea lions soaking up the sunshine. They are the most abundant marine mammals in the archipelago, sleeping on Galapagos’ beaches and swimming close to shore. Photo opportunities will be rife, especially during the pupping season, but remember to keep a respectful distance. These seals are unique in that they can ‘gallop’ across the land, exceeding the speed of a human running across the rocky ground. The vibrant feet of the blue-footed booby birds make them the easiest Galapagos creatures to identify, and some of the most photographed. But these impressive tootsies aren’t a happy mistake – they have evolved for use in the bird’s courtship dance due to the pigments in the food which they eat. Males brandish their feet at the females, with the lucky lady choosing the bird she thinks has the most vibrant feet. It’s a clumsy display belied by the booby bird’s aerial acrobatics. Once a bird takes to the air and a fish is spotted, it makes a spectacular dive, folding back its wings until it resembles an arrow searing through the water at speeds up to 60mph, seizing fish with its serrated beak. A Galapagos cruise wouldn’t be complete without a photograph of the Galapagos giant tortoise lumbering across the landscape. 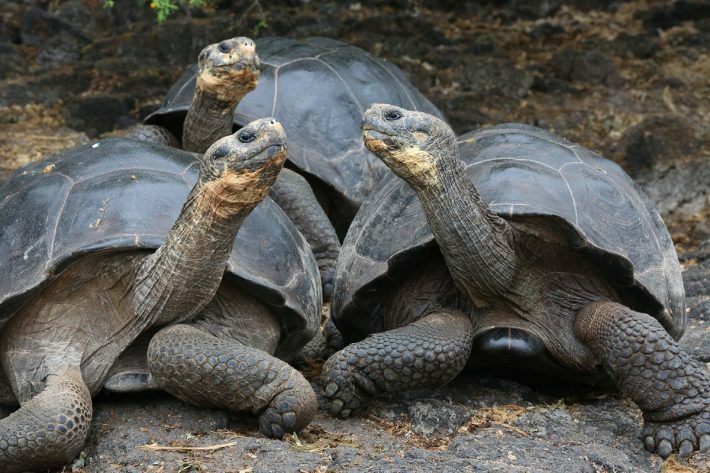 These archetypal animals are very special indeed – one of the last two remaining groups of giant tortoises anywhere on the planet. When you catch your first glimpse of a Galapagos giant tortoise depends on when you embark on your expedition. During the cool season, tortoises are more active around midday, while in the hot season, they prefer foraging early in the morning or late in the afternoon. Earth’s southernmost continent represents the peak of exploration: a land of extremes where wildlife faces a constant struggle for survival. Looming icebergs and breath-taking glaciers present constant photo opportunities, while the breath-taking wildlife adds even more raw beauty to this region. 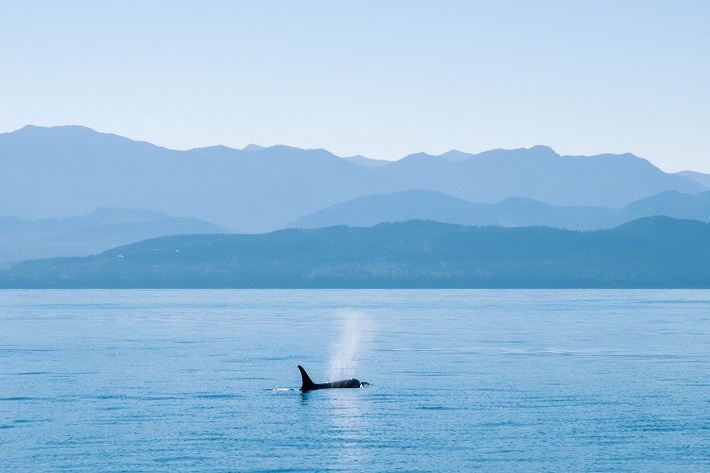 The sea is home to gentle giants and the skies play host to swooping sea birds, while on land, seals and polar bears dominate the beaches and ice flows. There is no shortage of photo opportunities during Antarctica cruises, so here are some of the wildlife highlights. The largest of all living penguins is synonymous with Antarctica. Standing at more than a metre tall, there is no mistaking the Emperors chubby frame and beautiful yellow collar. Enduring the very worst the Antarctic can throw at them, they will huddle together come blizzard or shine and devote themselves completely to their chicks. 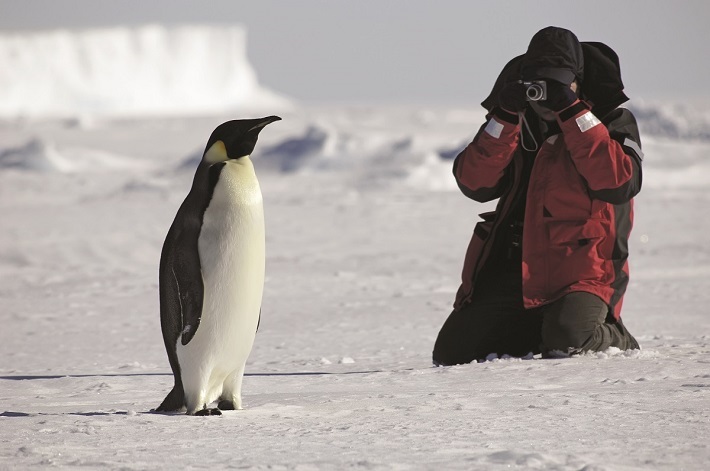 Our favourite Emperor penguin photo opportunity is their delicate courtship ritual. When two lifelong partners meet again during the breeding season, they mirror one another’s posture before bowing to each other. It is understated and completely lovely. 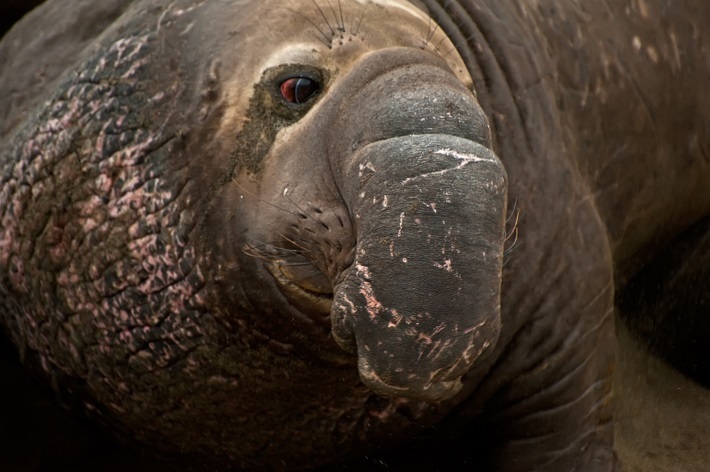 The southern elephant seal is a formidable creature: often the subject of fight scenes in wildlife documentaries! The males battle it out to lay claim to beaches and a harem of females during the breeding season, drawing more than a little blood. While getting close to these animals is out of the question, photographing them from afar gives an exciting glimpse into their extreme lifestyle. Did you spot these little thieves on David Attenborough’s Frozen Planet? Male Adelies build raised nests made of stones in preparation for the return of the females. The problem is, the best nests attract the ladies, and stones are at a premium. Rather than plump for second best, the penguins turn to a life of crime, stealing prime real estate from their neighbours and placing it proudly into their own nests. 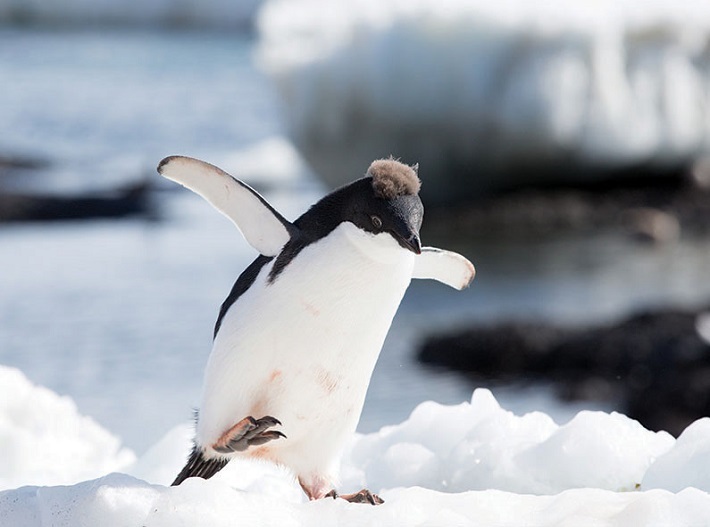 Adelie penguins are the most numerous penguin species in Antarctica, so there will be plenty of opportunities for you to snap pictures of these charming birds. The orca is another Frozen Planet celebrity. Working as a team, these beautiful mammals line up and swim under floating patches of ice, in sync, creating a wave that washes unsuspecting seals from this icy perch. It is a sight to behold, and while you aren’t guaranteed to snap this unique behaviour during an expedition, your first glimpse of a towering dorsal fin will take your breath away. These bucket list destinations have never been more accessible. Whether you explore them on-board Seabourn Quest, Silver Galapagos, Silver Explorer or Silver Cloud, you will return home with new eyes. Have you seen any of these incredible animals during a luxury cruise? Let us know in the comments below!